Our practice focuses exclusively on small animals such as dogs, cats, ferrets, rabbits, rodents and other small mammals. Brewer’s mission is to serve the pet-owning public of Springfield and surrounding communities with progressive, high-quality, and compassionate care, while keeping our prices reasonable. We want to make sure you feel right at home from your very first visit. 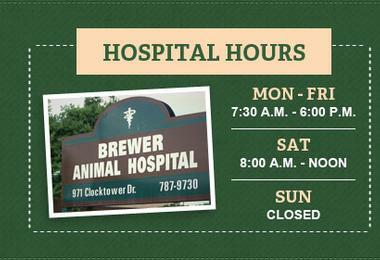 Take a moment and get to know our doctors and staff, and become familiar with our facility.